So, you know you want to buy a deck but with so many types to choose from how do you choose which one is right for your garden? 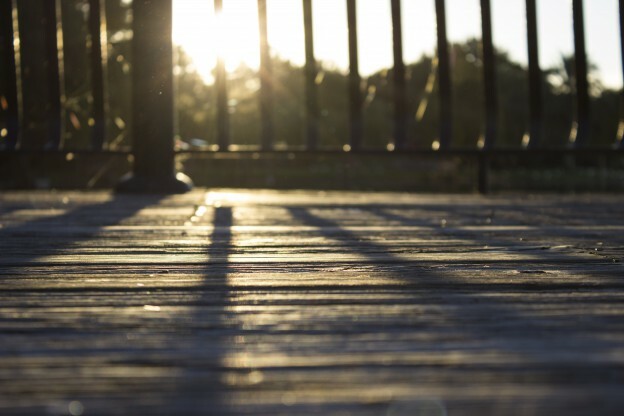 Decking is the perfect way to extend your living space but before you invest, it’s a good idea to consider these important questions to help you make the right choice. 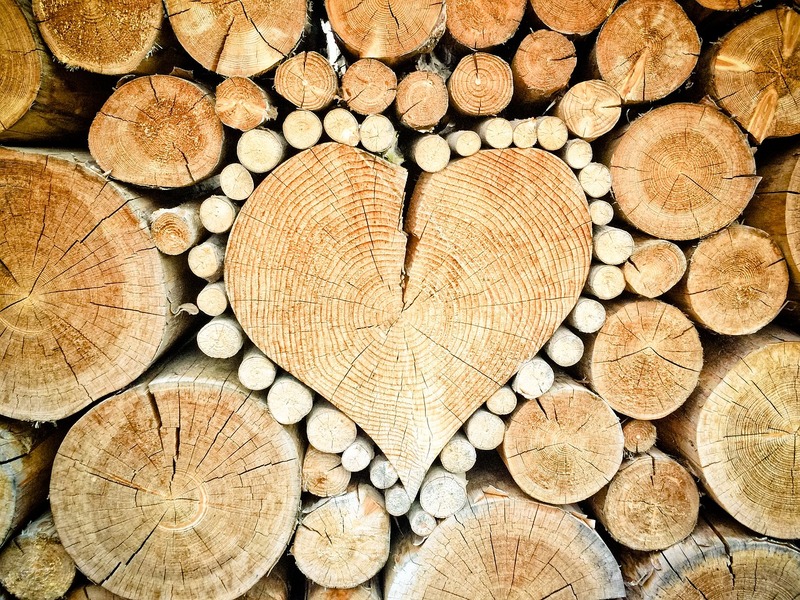 This question is a biggie as it’s important to choose a type of wood that will fit into your lifestyle. 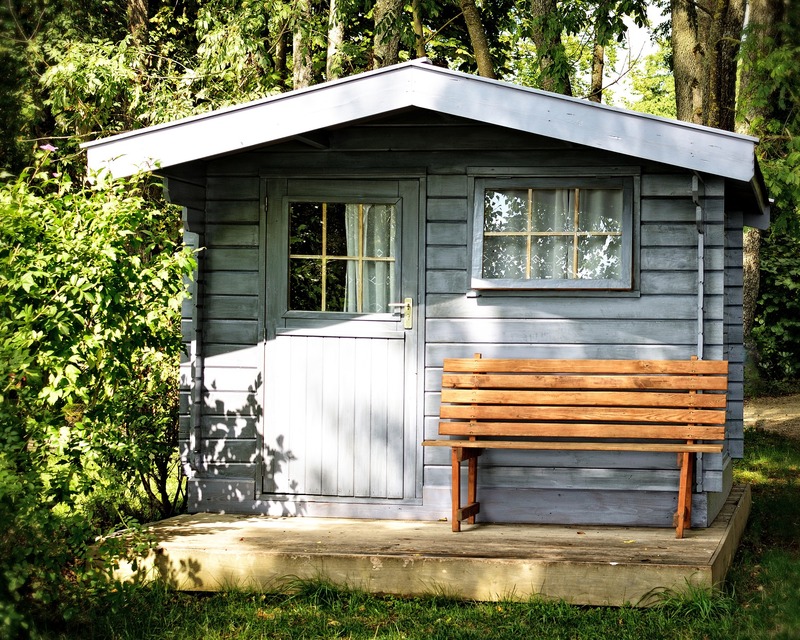 Different types of wood require different levels of maintenance, some kinds only need the occasional coat of decking varnish to look great, while you’ll need to show others a bit more TLC. If you have a busy lifestyle and you’re constantly being pulled in a million different directions, you need decking boards that are manufactured using a harder type of wood and require minimum effort to look stunning year after year. Composite decking or IPA hardwood decking are two of the strongest types of decking boards and require very little upkeep. If you have a bit more time to spend in your garden, softwood decking does require more frequent attention that hardwood but it’s worth it as this stunning wood will be a welcome addition to any garden. Just show it you care by adding a protective treatment every so often to protect it from the elements. While we’d never doubt your DIY skills but if this is your first time adding decking to your garden, it’s worth considering how confident you feel about installing it. 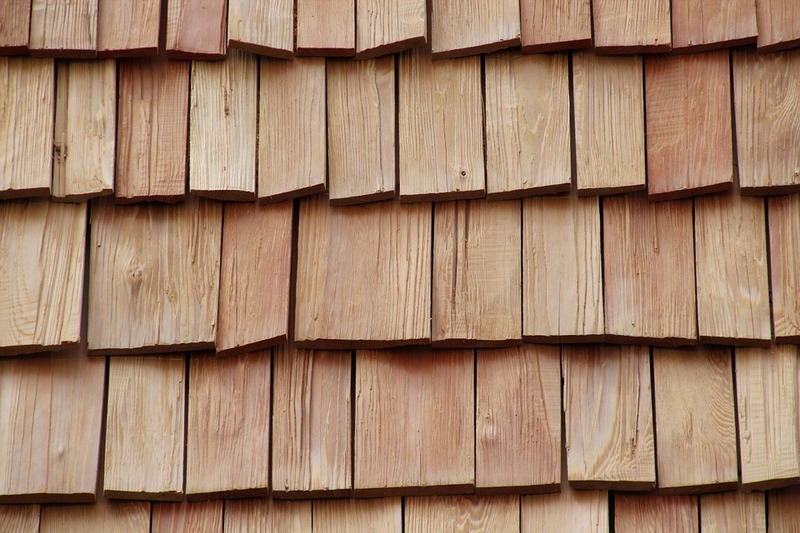 If the answer is very confident, then go ahead and choose any type of decking you like! However, if you’re a bit apprehensive about your first time installing a deck, why not make it easy for yourself by using easy to install decking tiles. Unlike traditional decking boards, ready-to-use decking tiles simply fit together and lock into place to take the hassle out of installation. Since you don’t need to construct a base, decking tiles are also quicker to install than decking boards. Simply lay them straight onto the ground! This also means you can use them on uneven surfaces. Don’t worry about being limited for choice if you’re going for decking tiles, eDeck’s decking tilesare available in softwood, hardwood and composite wood effect so you can pick the perfect style for your garden. Question 3: What Will I Use my Deck For? Similar to question 1, the purpose of your deck with effect what type of wood you should use to build your deck. If your decking will experience heavy footfall as a child’s play area for example, go for extremely durable hardwood or composite decking. Whereas, if you plan on using your decking for the occasional garden party or lounging in the sun (when it finally comes out), softwood decking will fit the bill. Leading on from question 3, what safety requirements or accessories do you need for your deck? If your young children will be playing on your deck, adding a handrail system is a great way to increase safety and prevent curious children from wandering off. Alternatively if you’re planning on being the no.1 host or hostess this summer, decking lights will allow you make the most of warm summer evenings and let the party continue long after the sun goes down. 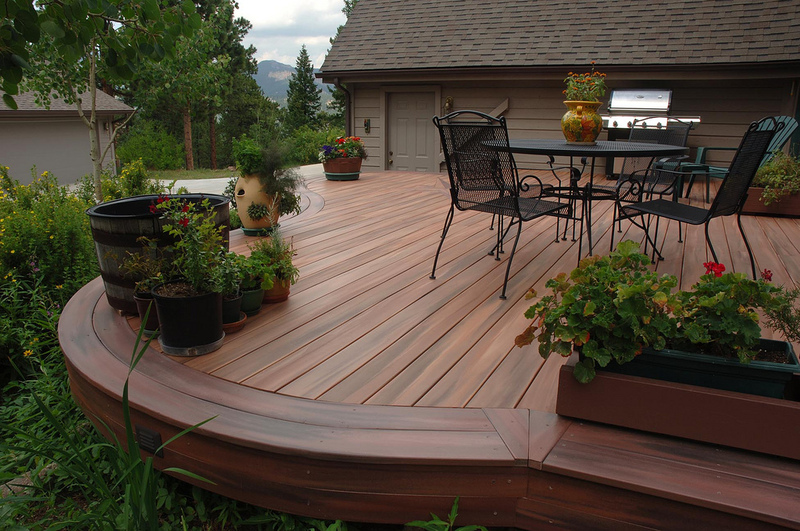 At eDecks you’ll find all the decking supplies you need at incredibly low discounted prices! Shop online today to create the garden you’ve always wanted. This entry was posted in Decking Advice on June 24, 2015 by peach. Ahhh the summer – time for BBQs, garden parties and lazy days relaxing on your garden furniture. When the sun comes out it’s rattan furniture’s time to shine! 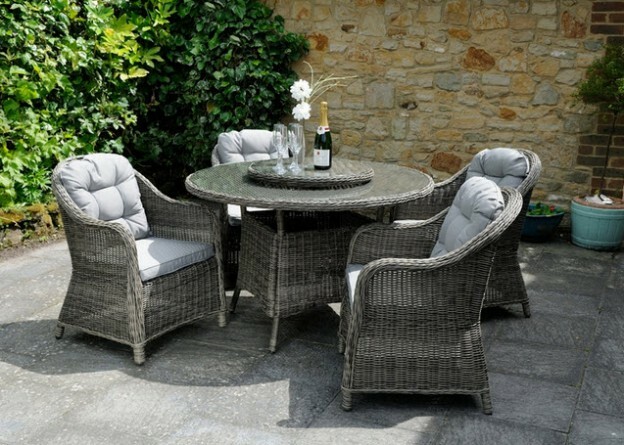 Garden furniture is essential for creating a space where your guests can unwind and come together to make the most of the warm weather. High quality rattan furniture, like the range from eDecks (excuse the shameless plug!) 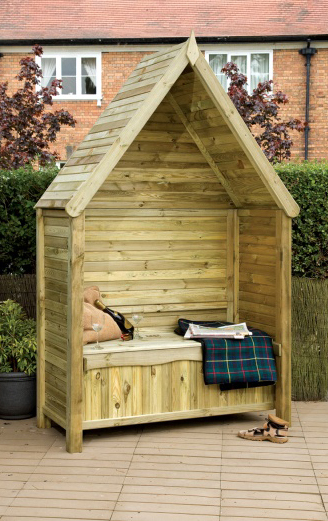 will be treated to ensure that it’s resistant to staining, moisture damage and rot. This means that it will look as good as new with little maintenance required. However, if you think it’s time to show your rattan a little bit of love and attention, just follow our 3 simple steps to care for your rattan furniture. Use your soft-bristle brush to sweep the surface of your furniture; making sure you get into all of the nooks and crannies, to remove any dirt and dust that has settled but isn’t stuck. This will allow you to check if your furniture needs a deep clean or if a light brush down will do the trick. Always use a soft-bristle brush when you clean your rattan furniture to avoid damaging the fibres. Once you’ve got rid of the surface dirt, give your outdoor furniture a light rinse with water but be careful not to soak your furniture as this could weaken the fibres. If there’s any tough to remove stains or lingering dirt left over from your initial clean, tackle it with a tough yet, gentle deep clean! Unlike cleaning decking, caring for your rattan furniture requires a soft touch so, ditch the powerhose for your trusty soft-bristle brush and use a gentle cleanser to give the surface of your furniture a good scrub. Then simply rinse and pat dry using a soft towel or, leave to dry in the sun if the weather allows. In the off-chance that you spot mold, simply remove by donning your gloves and use fine-grain sandpaper to scrub very lightly and remove the mold. Make sure you cover your furniture when it’s not in use to extend the lifespan of your rattan furniture. Covers made from tough, durable material will protect your furniture from harsh, wet winter weather as well as Britain’s potentially harsh, wet summer weather! This probably goes without saying but when you’re shopping for furniture covers, always make sure that they’re waterproof just like eDecks’ rattan furniture covers! Over the winter months, make sure that your garden furniture is stored upright to allow any accumulated water to drain away. It’s also a good idea to bring furniture accessories like pillows inside when the rain comes on. Now you’ve restored your rattan furniture to it’s former glory, pour yourself a drink and relax – you’ve earned it! Find all the rattan furniture supplies you need at low discounted prices online at eDecks. Browse the range today! This entry was posted in Gardening Advice on June 18, 2015 by peach. All parents know that keeping the little ones entertained during the summer holidays can be challenging! Don’t settle for another game of hide and seek; you and your child could be out in the garden having fun and learning about nature with these top games. This is a great way to get kids thinking about different scents in the garden. 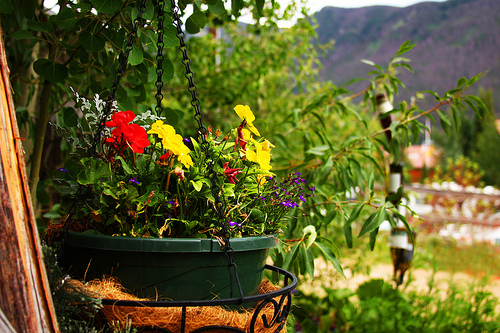 Ask your kids to collect as many different flowers, leaves and herbs as they can in 10 minutes. Once you have a nice little collection of various plants and leaves, get them to sort them into groups based on how they think each plant or flower will smell i.e. sweet, smelly, spicy, strong, savoury etc. Then label each pile based on their guess. Once they’ve grouped their collection of plants by scent, let your child smell each plant to see if they guessed right. If you have a group of children playing the garden scent game, why not award a point for every right answer and have a prize for the winner? Sunflowers are the perfect type of plant to get kids interested in gardening! You child will see their seeds sprout a week after they’ve planted them, in 2 weeks it’ll be a seedling and in a month it’ll already be 2’ tall. Get each child to plant one or, plant one yourself and challenge your child to a race to see who can grow the tallest. If you plant an edible type of sunflower, you can enjoy tasty, nutritious sunflower seeds at the end of the race. Scrapbooking may seem a bit quaint in the days of Xboxes and Wiis but they’re prefect for encouraging children’s to get creative and learn about nature. Get your child started by giving them a large blank scrapbook and art supplies like glue, glitter, crayons and felt-tip pens; then encourage them to start building up their scrapbook with leaves and plants they find around the garden or in the park. Why not take pictures of them in the garden to add to the scrapbook or, ask them to draw and label any wildlife they see? Get your little pirates out of the house and exploring the garden with a fun treasure hunt. This is a great activity to do when your children’s friends come round to visit. Give them a list of items to find around the garden to keep them entertained for an afternoon – gold coins at the end are optional but having a prize for when they find all the items is a good way to motivate them to play. The list could be anything you can find in the garden; how about getting them to find different types of plants, different shaped items around the garden i.e. circle, square etc. or an item of every colour of the rainbow? 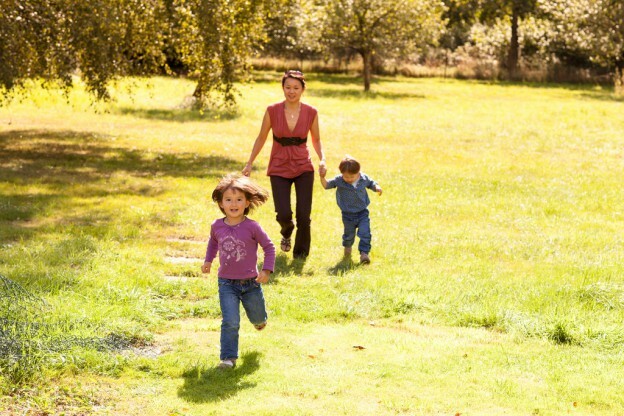 What are your top tips for keeping your children entertained in the garden this summer? Leave a comment to let us know! Find everything you need to create a stunning garden with eDecks. We have a fantastic range of gardening supplies for budding gardeners of all ages. This entry was posted in Gardening Advice on June 9, 2015 by peach. If eDecks’ ruled the world they’d banish dull gardens for good! Adding a bit of colour into your garden needn’t be expensive, a strategic splash of paint can do the trick. To help you out, here’s three ways you can brighten up your garden this week. Fallen out of love with your garden décor? Update it in a flash by giving your plant pots a lick of paint. If you’ve got leftover paint from when you were decorating the house this is a great way to use it up. If you don’t already have paint around the home, most DIY stores can set you up with smaller sample pots of paint free of large or for a small free. If you have you kids why not by get them involved as a fun way to keep them entertained at the weekend? 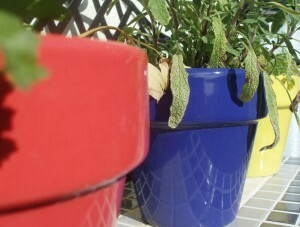 Bright, primary colours give your garden a lively, fun edge. Don’t hold back on patterns or funky designs – if you don’t like how it turns out you can always paint over them and start again! 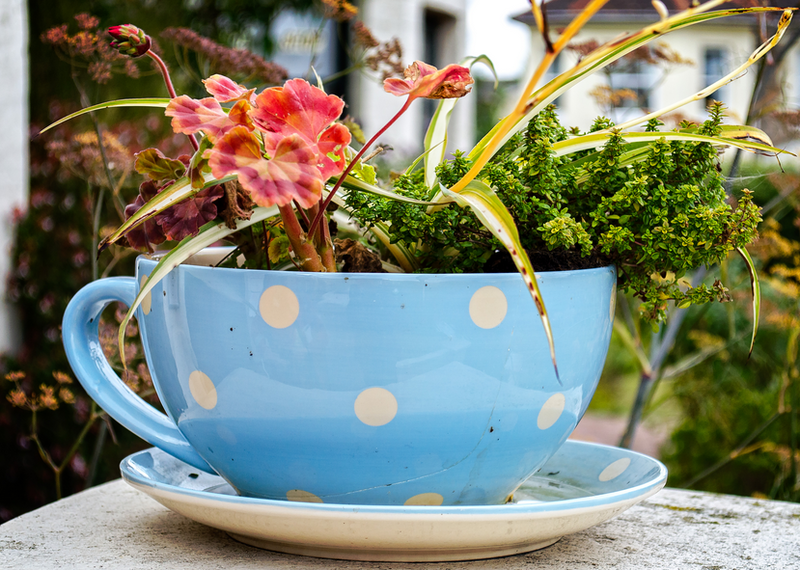 If you’ve got an artistic flair, visit the local craft store for art supplies like sequins, ribbons and buttons that you can use to turn a humble plant pot into a work of art. Why buy pots at all when you can make your own from everyday objects that have outlived their use. 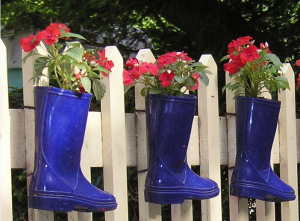 Wellington boots make great planters – try setting yours on your doorstep for a welcoming way to invite guests or use your welly boots to give a dull fence some personality. Dull decking bringing you down? You can easily breathe new life into your deck with a coat of varnish or a timber stain. 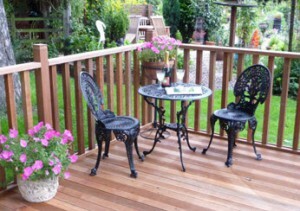 A well maintained deck will give your summer garden a polished appearance. All you need to do is wait for a dry afternoon (this will be the biggest challenge) then devote some time to cleaning your deck first. Once it’s spick and span, give it a coat of wood varnish or a protective deck stain to refresh the colour of your wood. As an added bonus, adding varnish or a stain will also protect your decking timber from rot and decay over time. Now that your decking has been restored to its former glory you can go wild with handing lights, stencils and paint, climbing pants like ivy or large feature potted plants. The choice is yours! Find all the gardening supplies you need at low, discounted prices online at eDecks. Shop the range today. This entry was posted in Garden DIY on June 1, 2015 by peach.